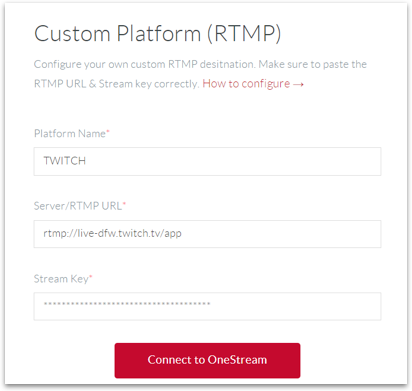 If you wish to stream using custom RTMP URL and Stream Key, then configuring custom social account is the easiest way to achieve that. Click on Configure button under Custom RTMP. 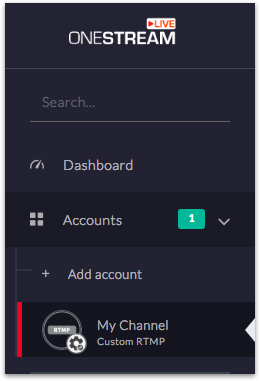 Give your custom social account a name of your choice, example My Channel, TWITCH, etc. Paste Stream Key in the field. This will also be provided by the streaming service where you will be streaming. Once all the fields are filled correctly click Connect to OneStream. 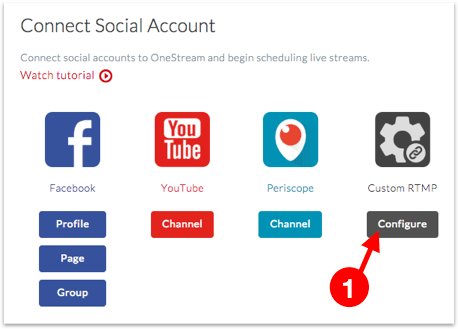 After successfully configuring the social account and connecting it to OneStream, it will appear in the sidebar under Accounts section.